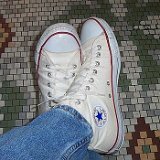 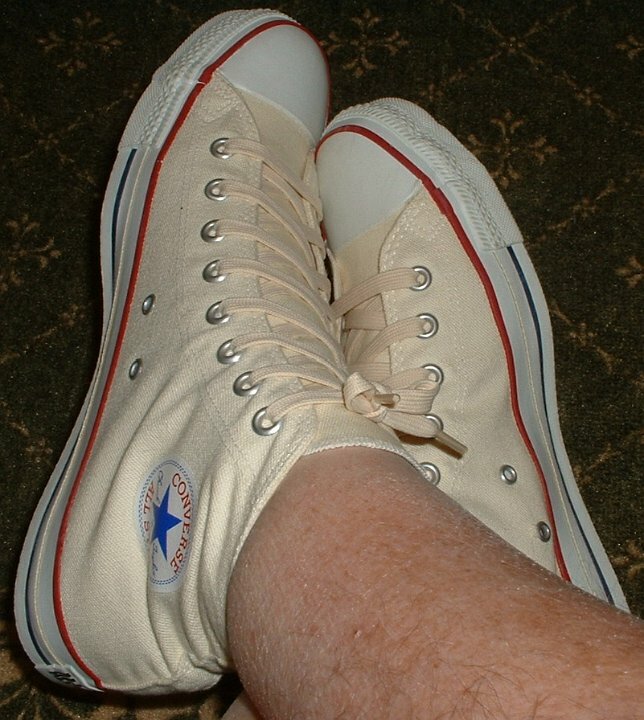 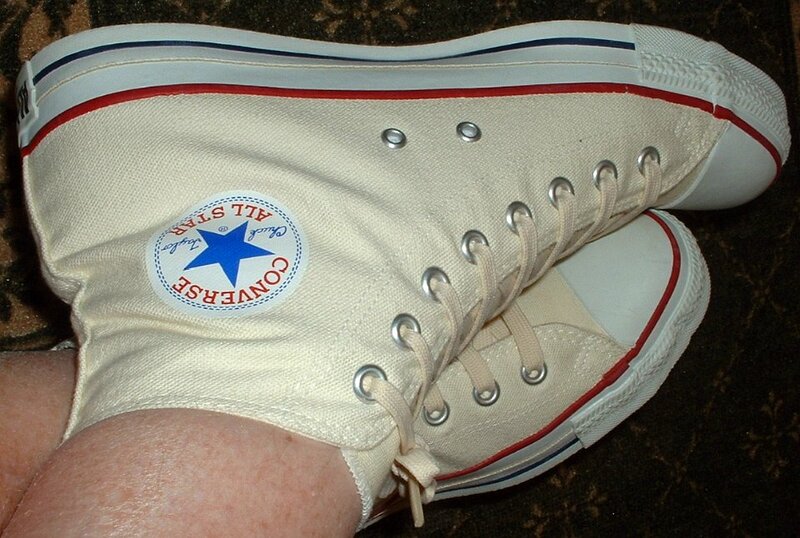 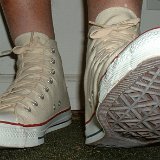 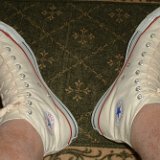 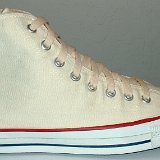 Photo gallery of natural (unbleached) white high tops, a core color. 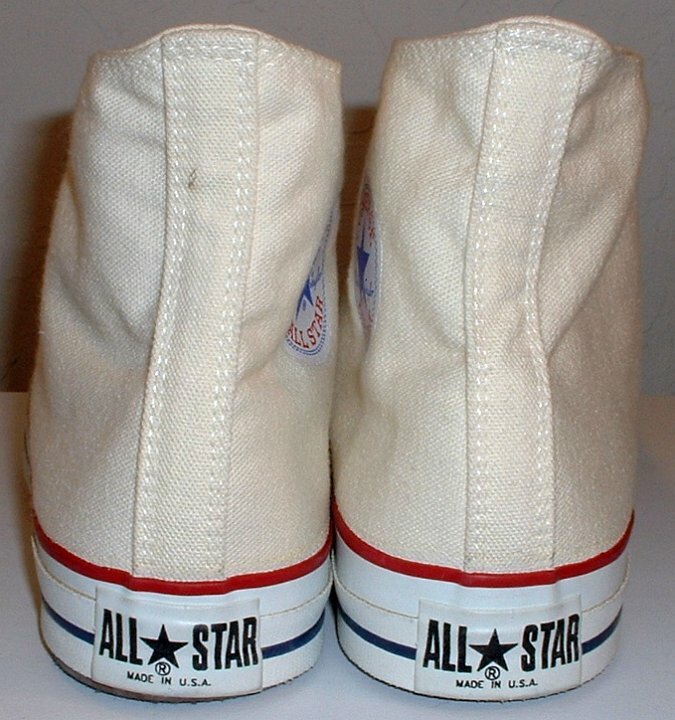 2 Natural White High Top Chucks Inside patch view of a left natural white high top. 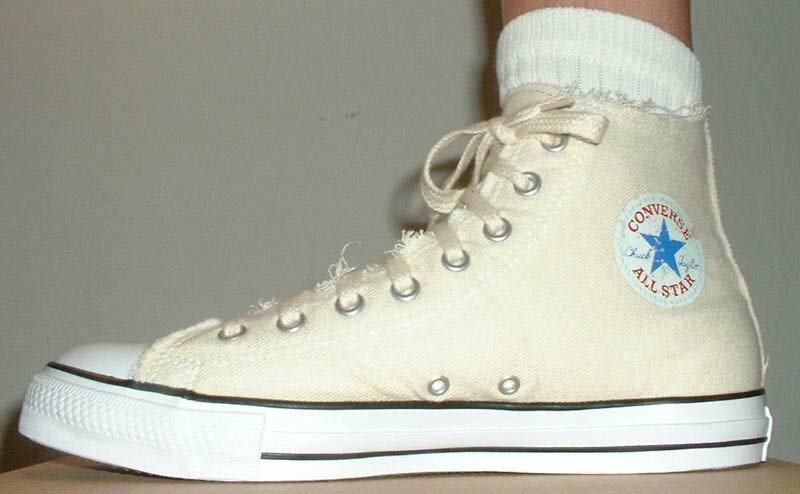 3 Natural White High Top Chucks Inside patch view of a right natural white high top. 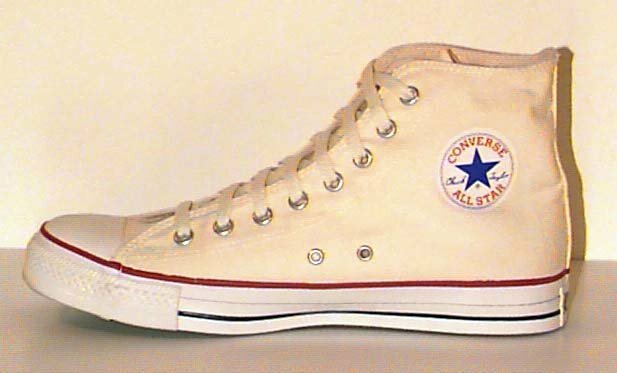 4 Natural White High Top Chucks Outside view of a right natural white high top. 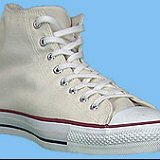 5 Natural White High Top Chucks Front view of natural white high tops. 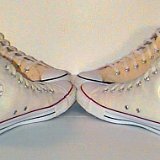 6 Natural White High Top Chucks Angled front to top view of natural white high tops. 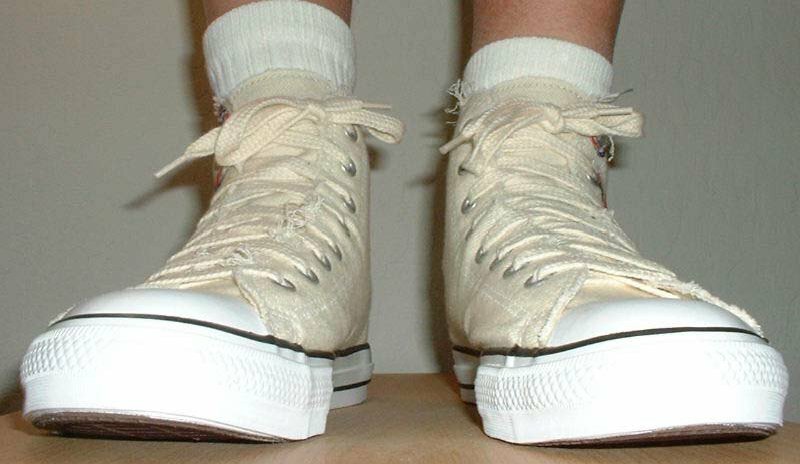 7 Natural White High Top Chucks Angled front view of natural white high tops. 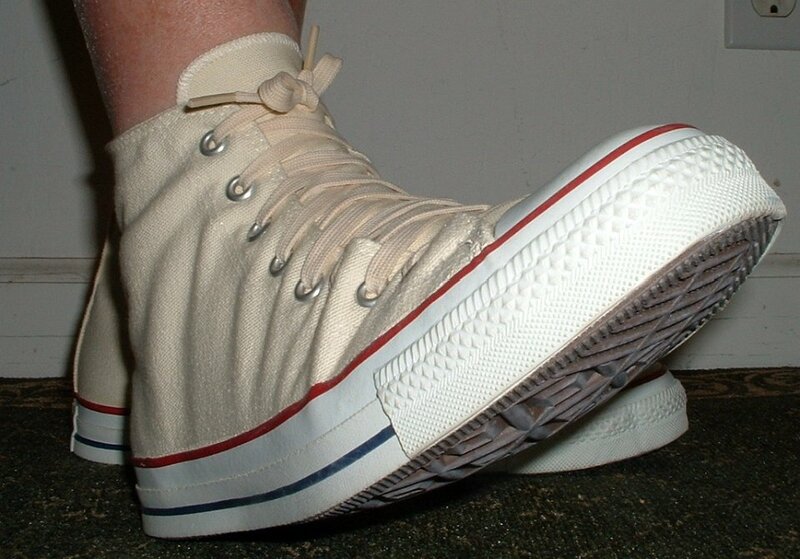 8 Natural White High Top Chucks Rear view of natural white high tops. 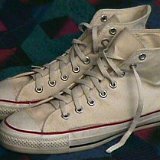 9 Natural White High Top Chucks Inside patch views of natural white high tops. 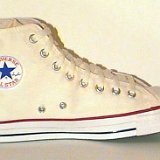 10 Natural White High Top Chucks Angled side view of natural white high tops. 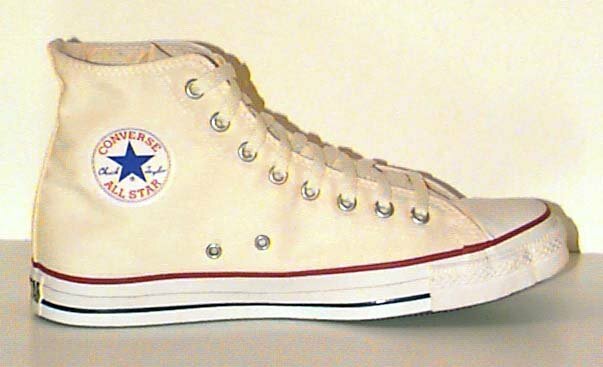 11 Natural White High Top Chucks Top view of natural white high tops. 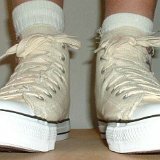 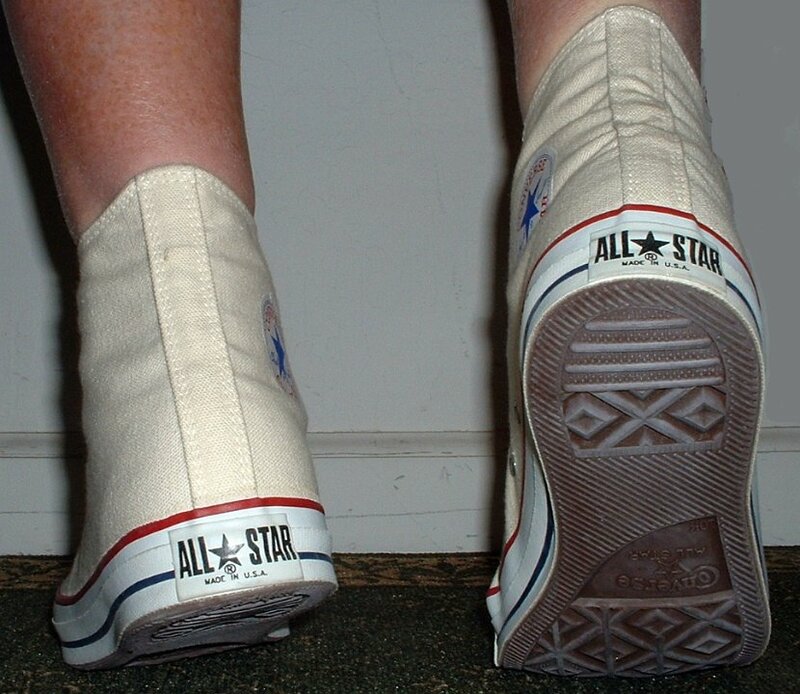 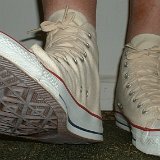 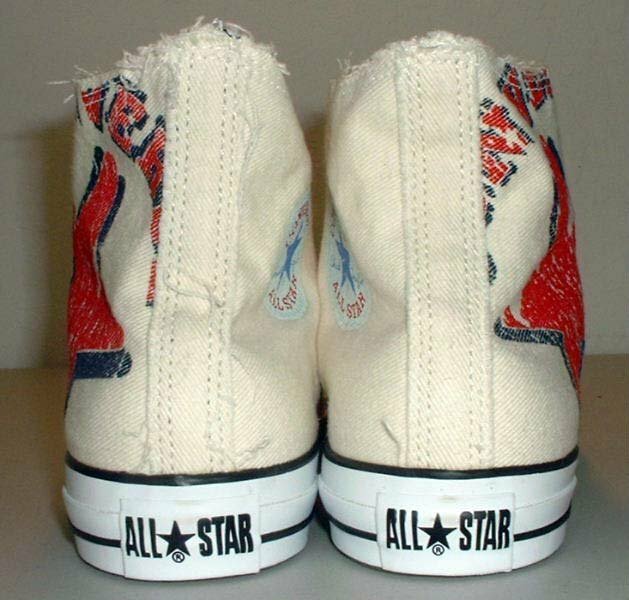 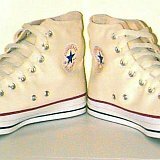 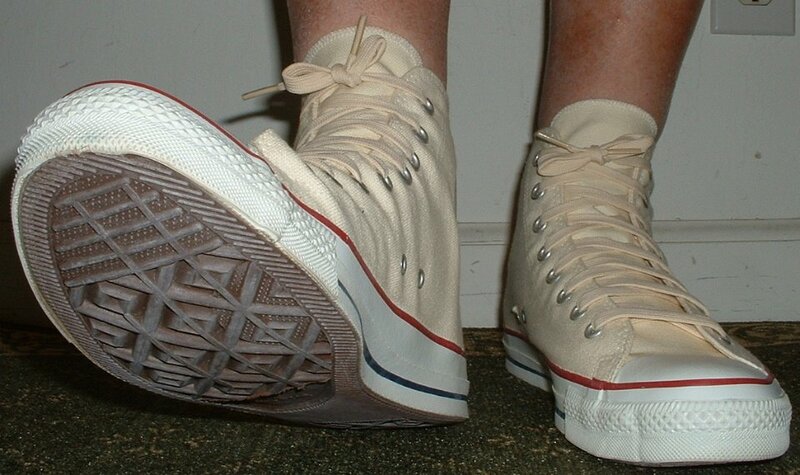 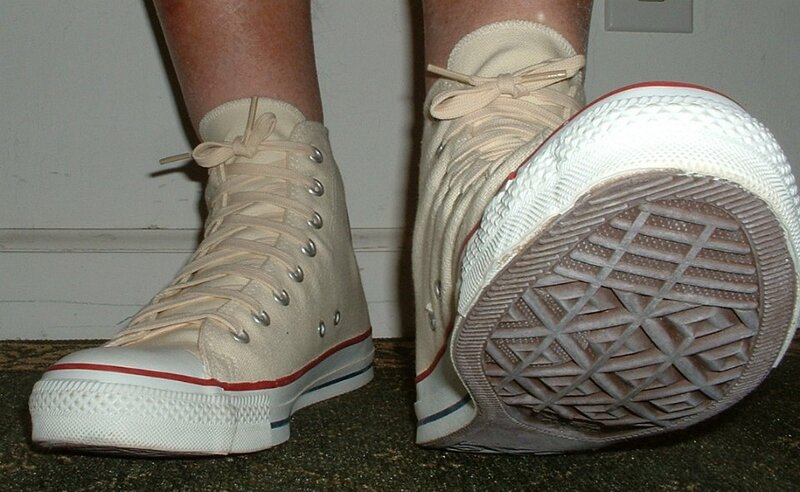 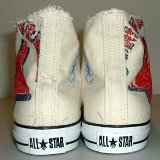 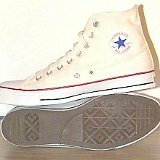 12 Natural White High Top Chucks Inside patch and sole views of natural white high tops. 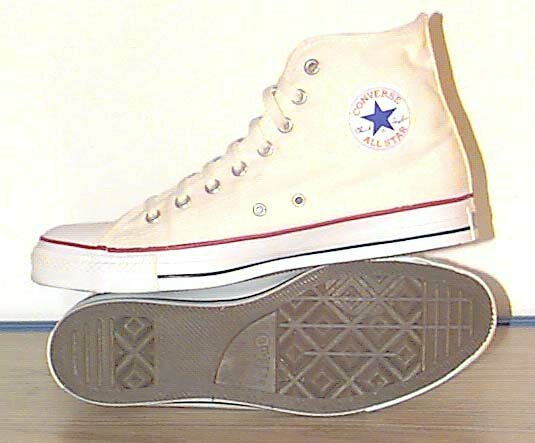 13 Natural (Unbleached) White High Top Chucks Inside patch view of a right natural white high top. 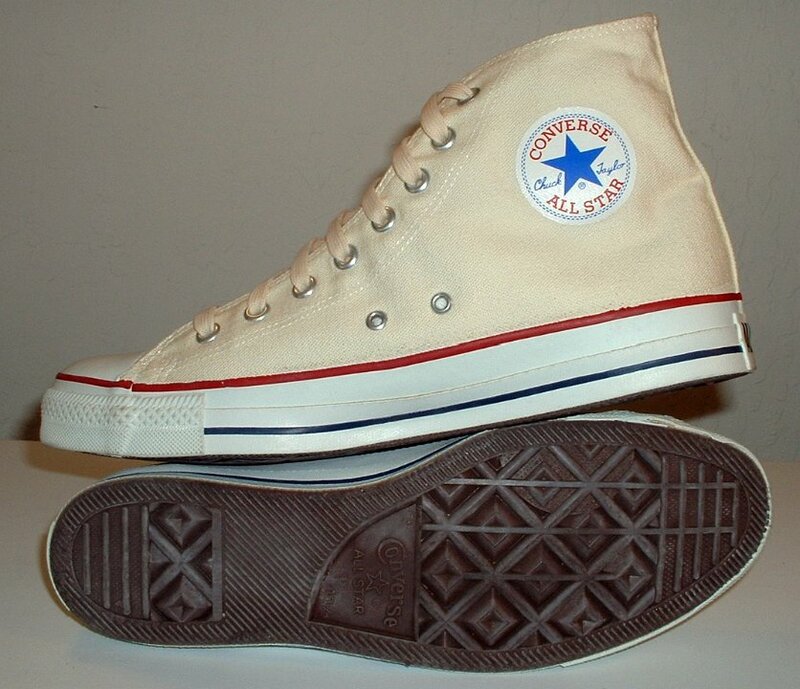 14 Natural (Unbleached) White High Top Chucks Inside patch view of a left natural white high top. 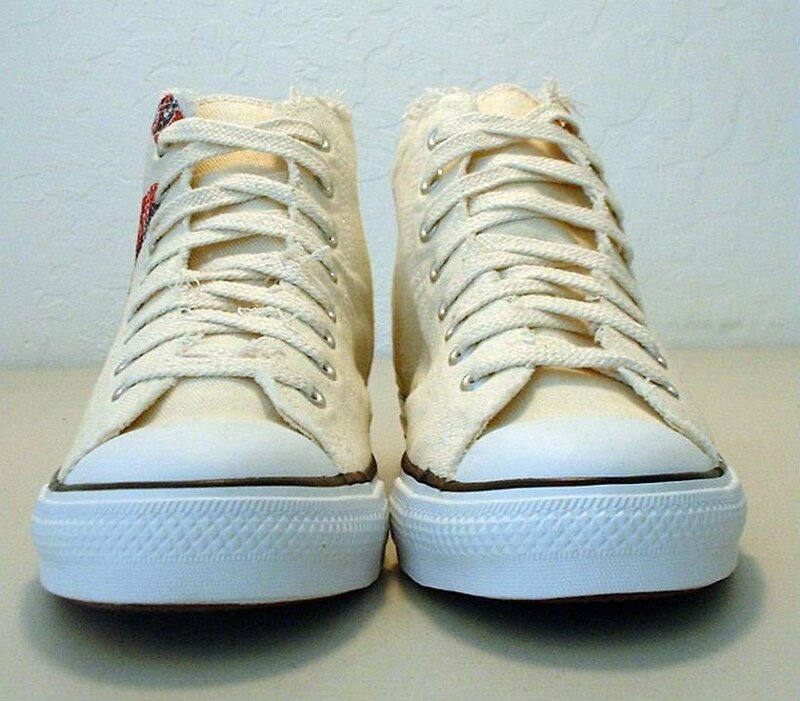 15 Natural (Unbleached) White High Top Chucks Inside patch view of a left natural white high top. 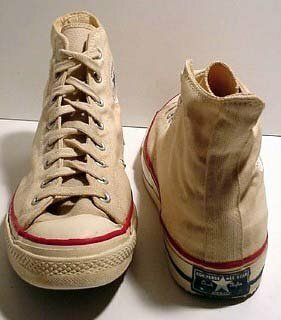 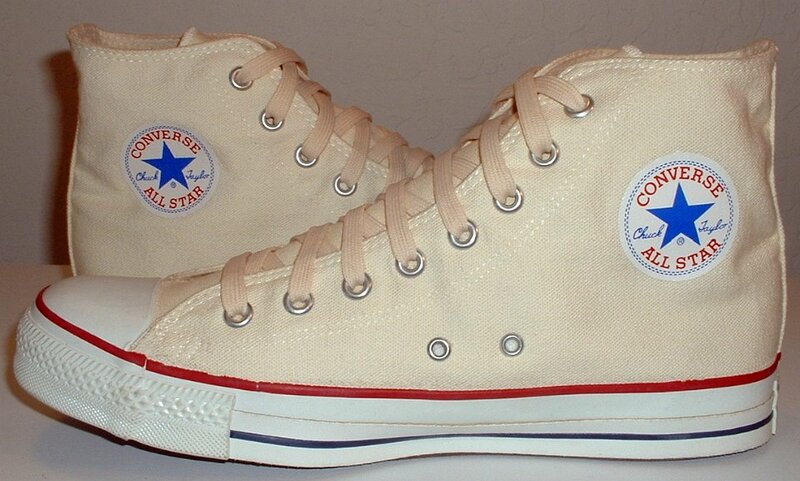 16 Natural (Unbleached) White High Top Chucks Inside patch view of a left natural white high top. 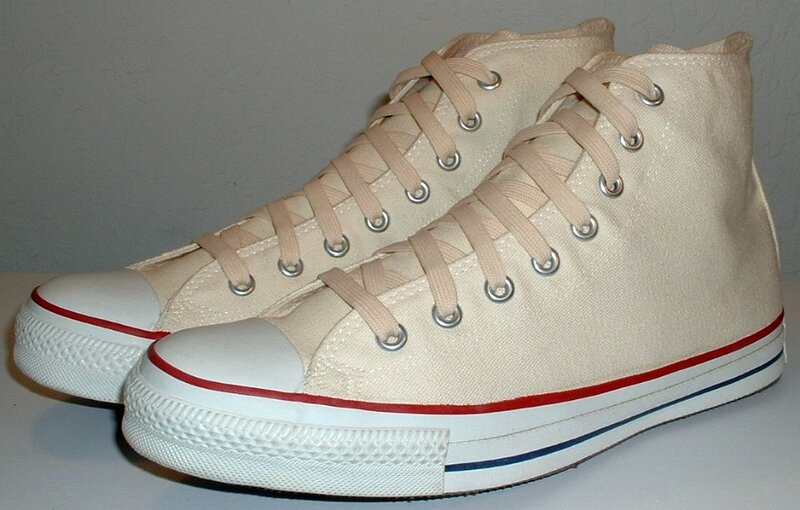 17 Natural (Unbleached) White High Top Chucks Rear view of natural white high tops. 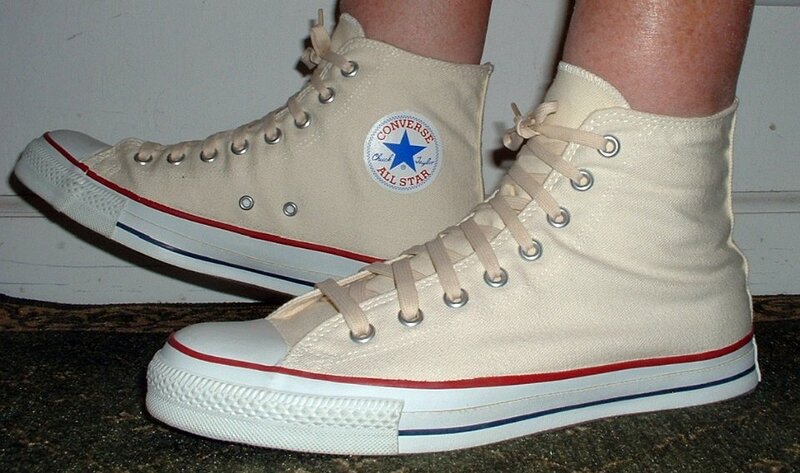 18 Natural (Unbleached) White High Top Chucks Staggered side view of natural white high tops. 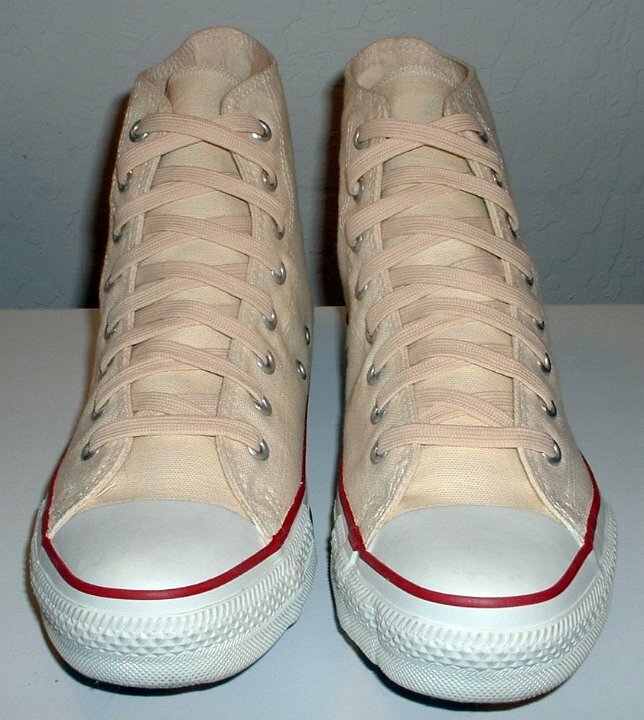 19 Natural (Unbleached) White High Top Chucks Angled front view of natural white high tops. 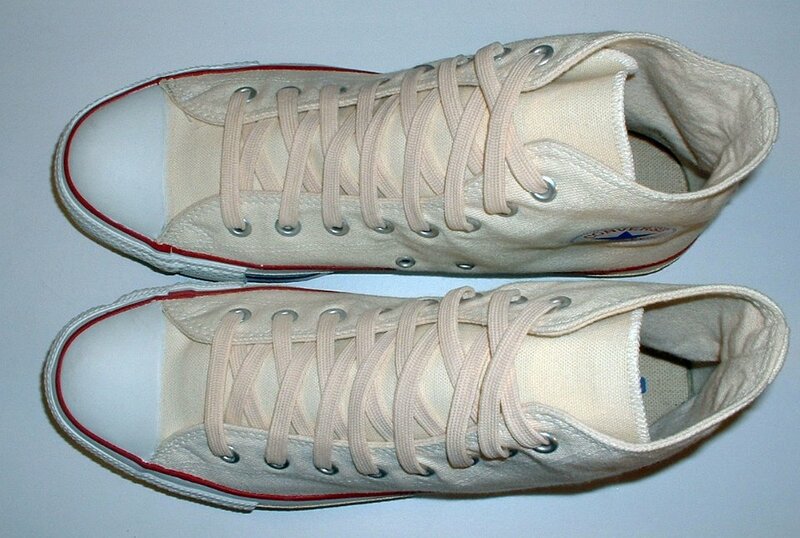 20 Natural (Unbleached) White High Top Chucks Inside patch and sole views of natural white high tops. 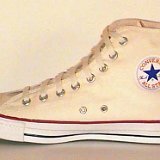 21 Natural (Unbleached) White High Top Chucks Wheel of natural white high tops. 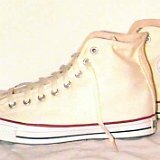 22 Natural (Unbleached) White High Top Chucks Wheel of natural white and yellow high tops. 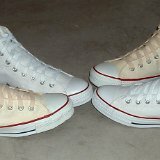 23 Natural (Unbleached) White High Top Chucks Two pairs of natural white high top chucks, side by side view. 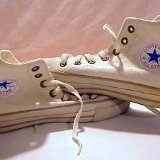 24 Natural (Unbleached) White High Top Chucks New vintage natural white chucks, top view. 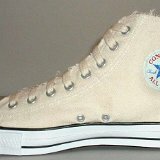 25 Natural (Unbleached) White High Top Chucks Front view of natural white high tops. 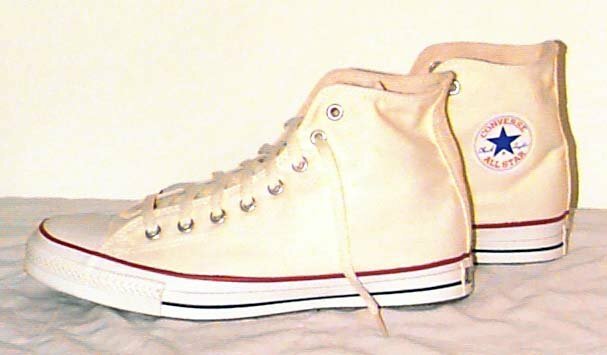 26 Natural (Unbleached) White High Top Chucks Wheel with yellow and natural white high top chucks. 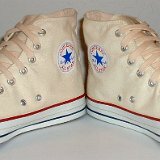 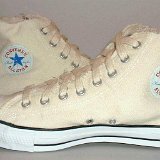 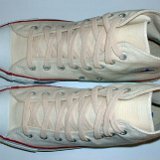 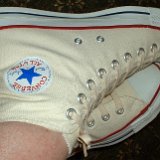 27 Natural (Unbleached) White High Top Chucks Natural white high tops, inside patch views. 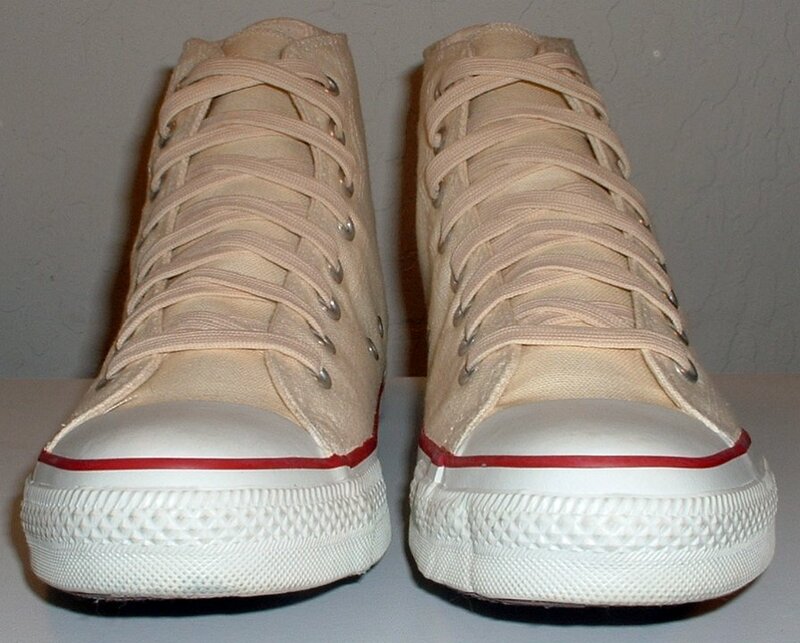 28 Natural (Unbleached) White High Top Chucks Staggered side view of natural white high tops. 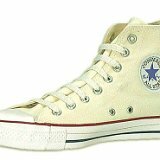 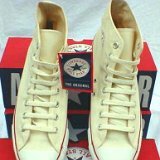 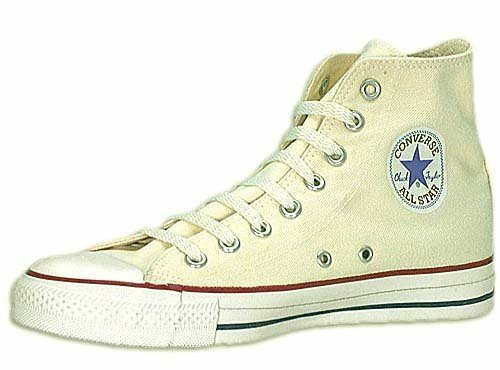 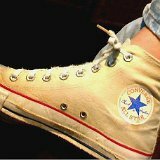 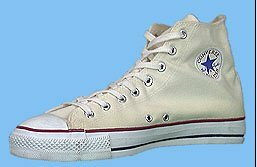 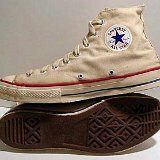 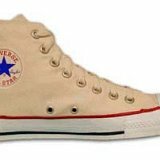 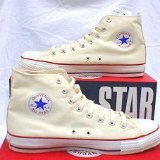 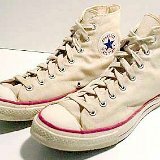 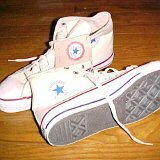 29 Natural (Unbleached) White High Top Chucks Vintage Natural White High Tops, showing inner sole and place for player's name. 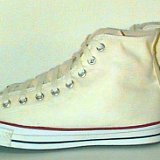 30 Natural (Unbleached) White High Top Chucks Angled side view of natural white high top chucks. 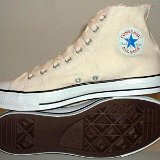 31 Natural (Unbleached) White High Top Chucks Brand new natural white high tops with box, inside patch views. 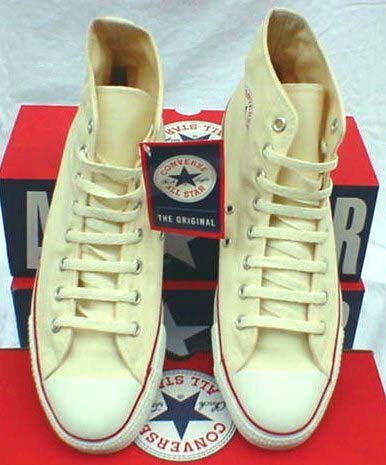 32 Natural (Unbleached) White High Top Chucks Brand new natural white high tops with box, angled top view. 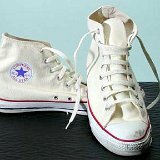 33 Natural (Unbleached) White High Top Chucks New natural white high top chucks with tag, angled inside patch and sole views. 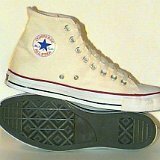 34 Natural (Unbleached) White High Top Chucks New optical white high tops, angled side and top views. 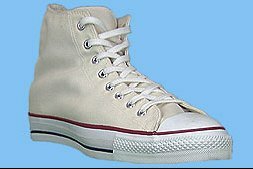 35 Natural (Unbleached) White High Top Chucks Rear view of optical white high tops. 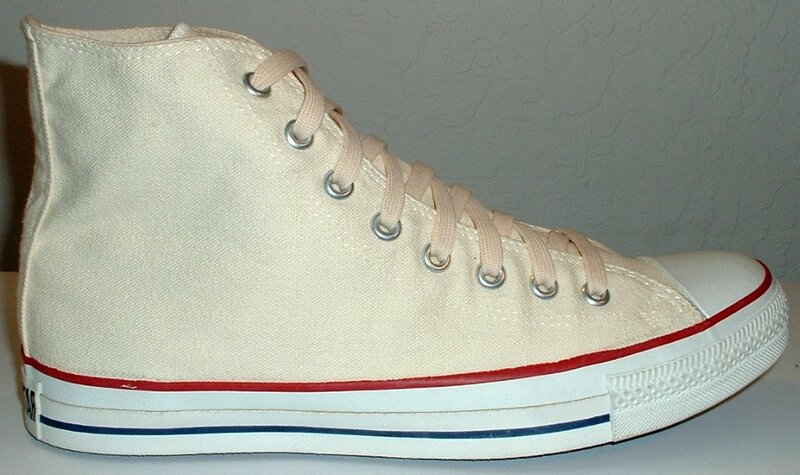 36 Natural (Unbleached) White High Tops Catalog photo of a right natural white high top, angled patch view. 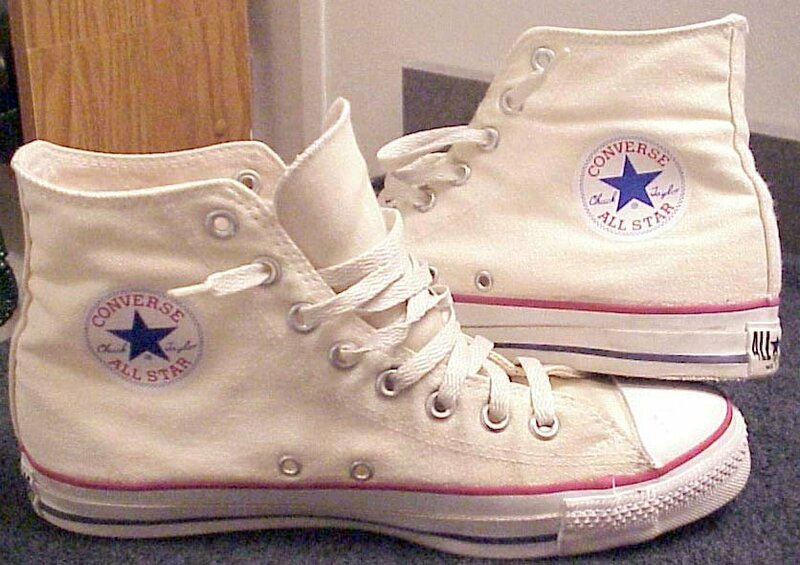 37 Natural (Unbleached) White High Top Chucks Front view of natural white high tops. 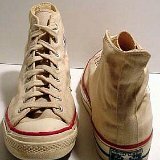 38 Natural (Unbleached) White High Top Chucks Front and inside patch views of natural white high top chucks. 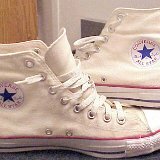 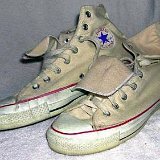 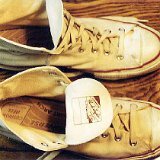 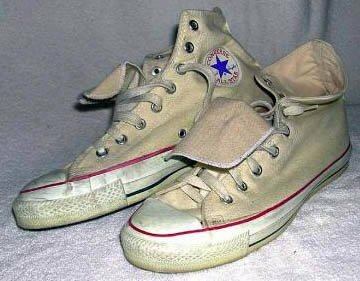 39 Natural (Unbleached) White High Top Chucks Inside patch views of worn and dirty natural white high tops. 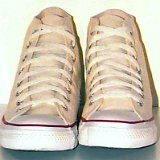 40 Natural (Unbleached) White High Top Chucks Vintage natural white high tops, angled side view. 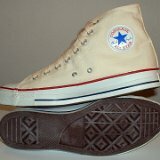 41 Natural (Unbleached) White High Top Chucks Inside patch and sole views of natural white high tops. 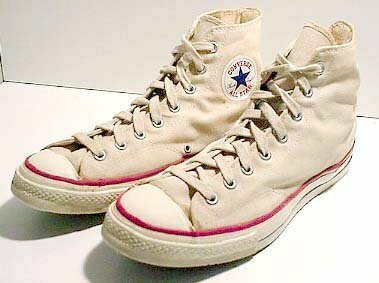 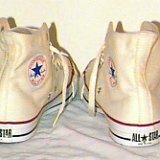 42 Natural (Unbleached) White High Top Chucks Front and rear views of vintage natural white high tops. 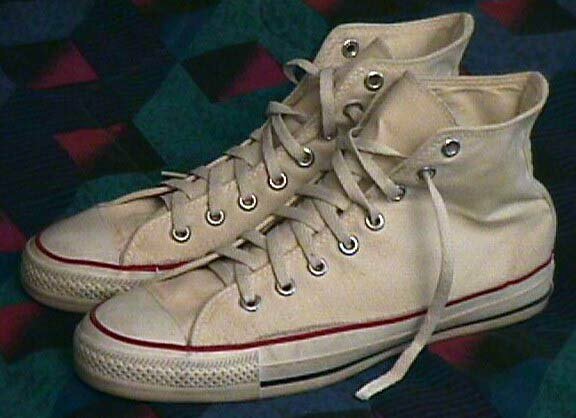 43 Natural (Unbleached) White High Top Chucks Angled side view of worn and dirty natural white high tops. 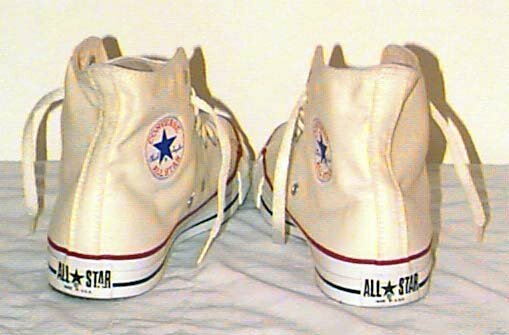 44 Natural (Unbleached) White High Top Chucks Angled side view of natural white high tops. 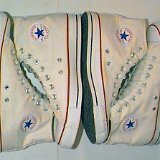 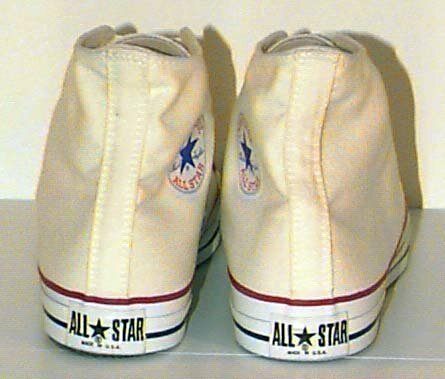 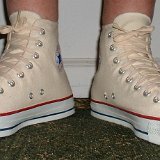 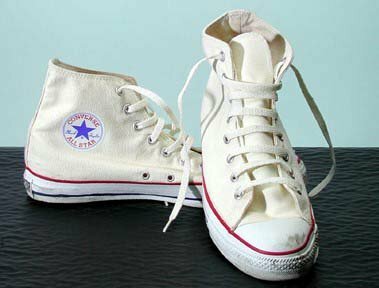 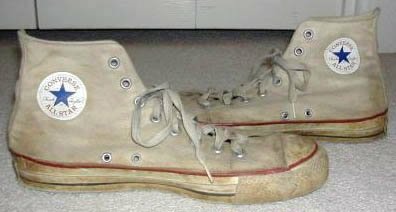 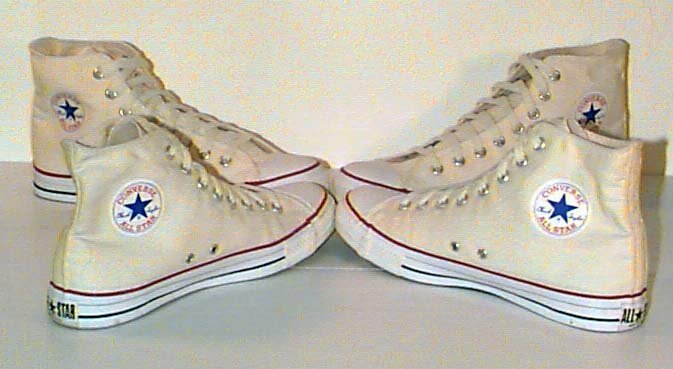 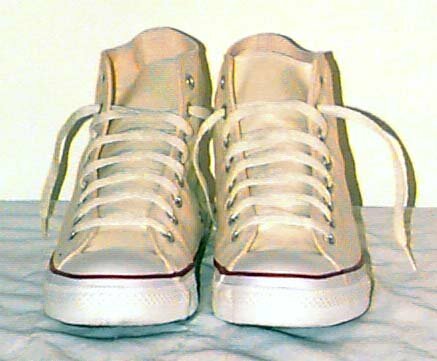 46 Natural White High Top Chucks Angled front and outside view of a right natural white high top. 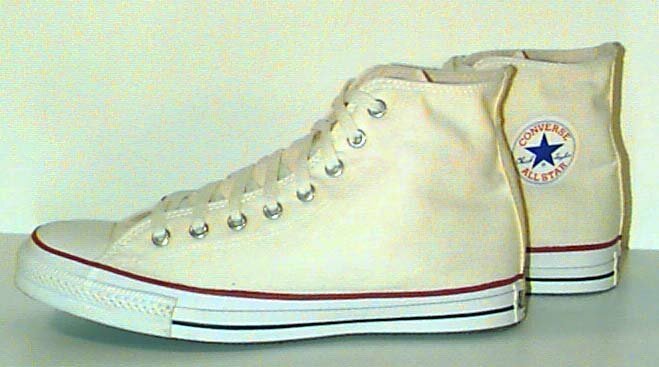 47 Natural White High Top Chucks Angled inside patch view of a right natural white high top. 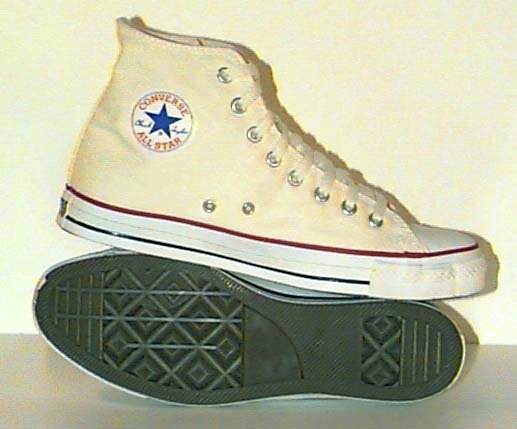 48 Natural White High Top Chucks Outside view of a right natural white high top. 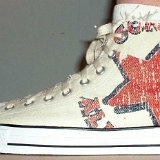 50 Natural (Unbleached) White High Top Chucks Inside patch view of a left graphic star high top. 51 Natural (Unbleached) White High Top Chucks Outside view of a left graphic star high top. 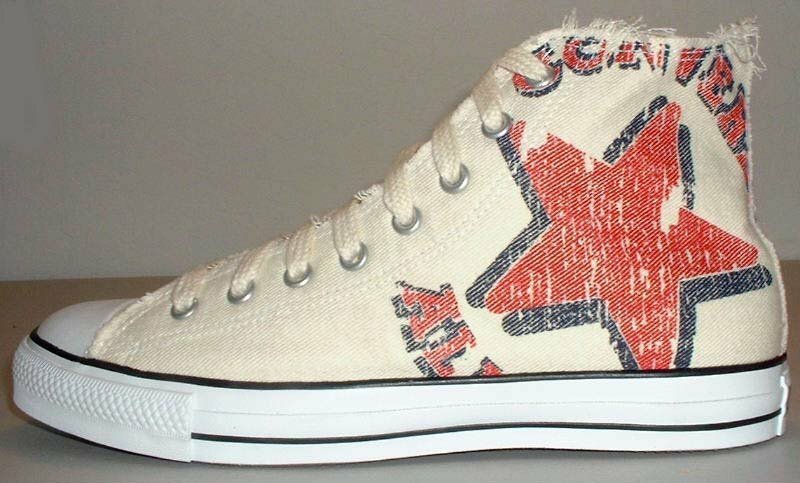 53 Natural (Unbleached) White High Top Chucks Inside patch view of a right graphic star high top. 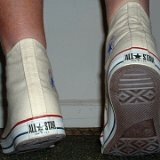 54 Natural (Unbleached) White High Top Chucks Rear view of graphic star high top chucks. 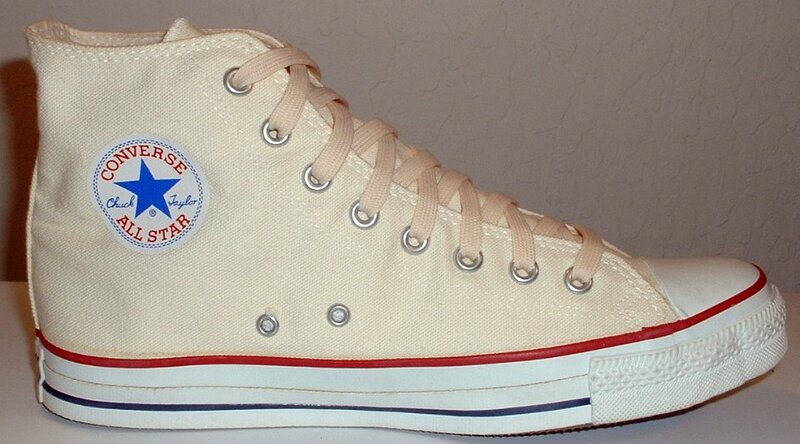 55 Natural (Unbleached) White High Top Chucks Inside patch and sole views of graphic star high top chucks. 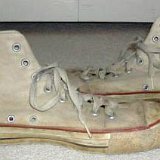 56 Natural (Unbleached) White High Top Chucks Outside and sole views of graphic star high top chucks. 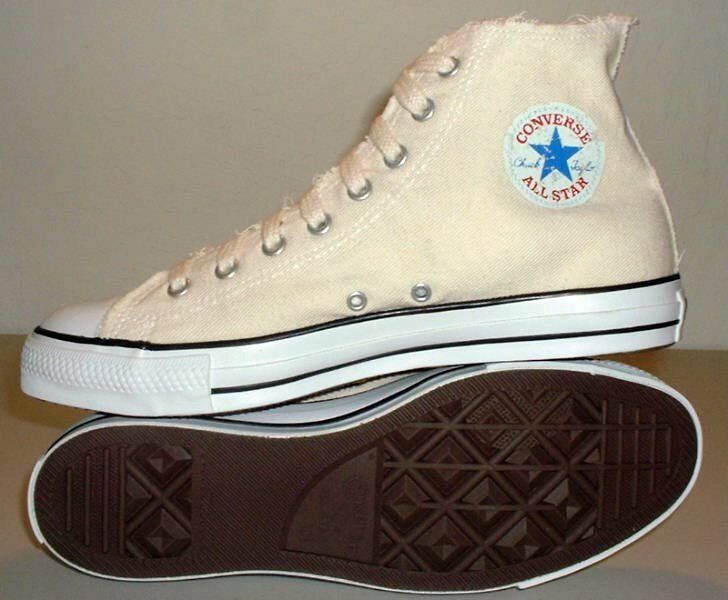 57 Natural (Unbleached) White High Top Chucks Angled side view of graphic star high top chucks. 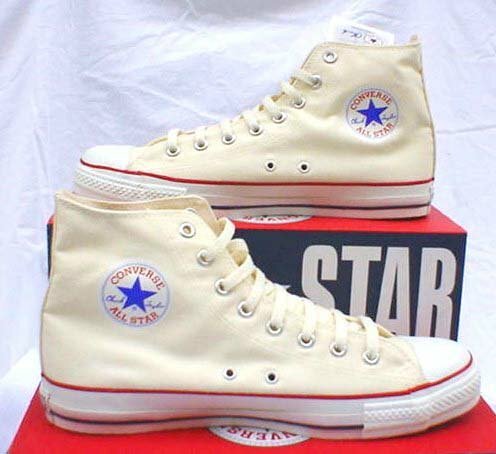 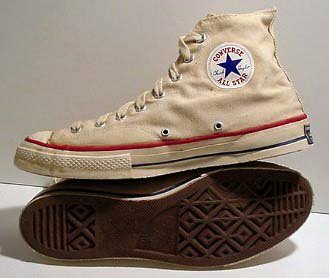 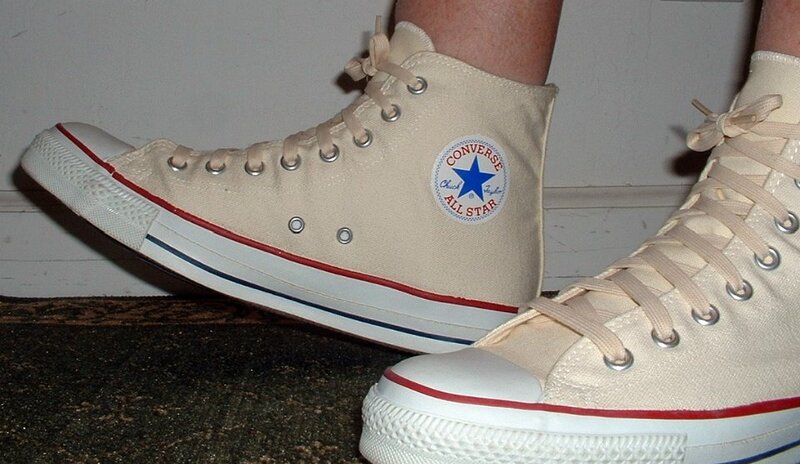 58 Natural (Unbleached) White High Top Chucks Outside views of graphic star high top chucks. 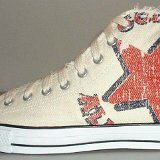 59 Natural (Unbleached) White High Top Chucks Top view of graphic star high top chucks. 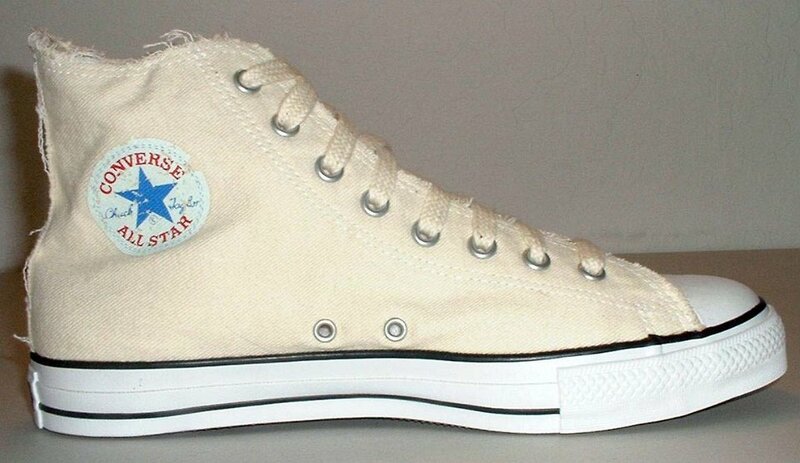 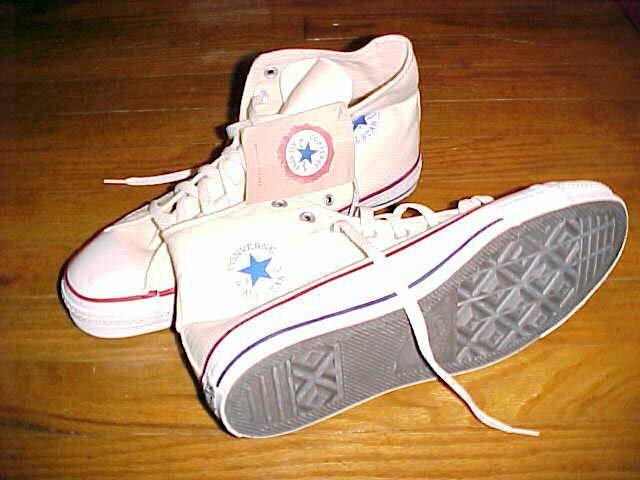 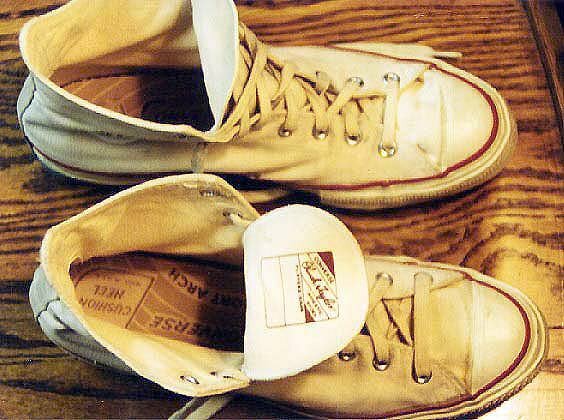 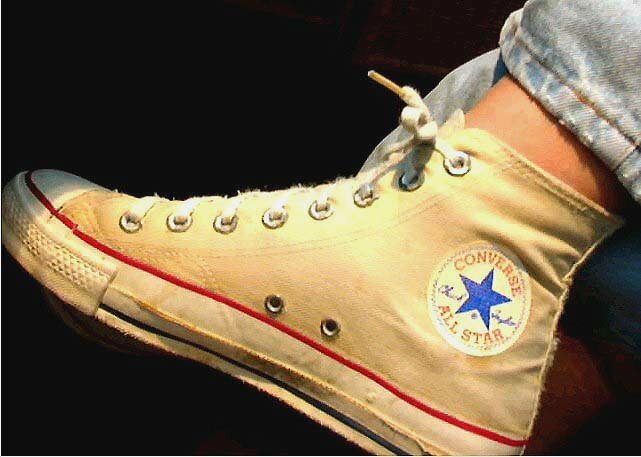 60 Natural (Unbleached) White High Top Chucks Inside patch views of graphic star high top chucks. 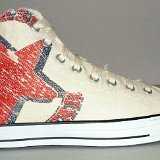 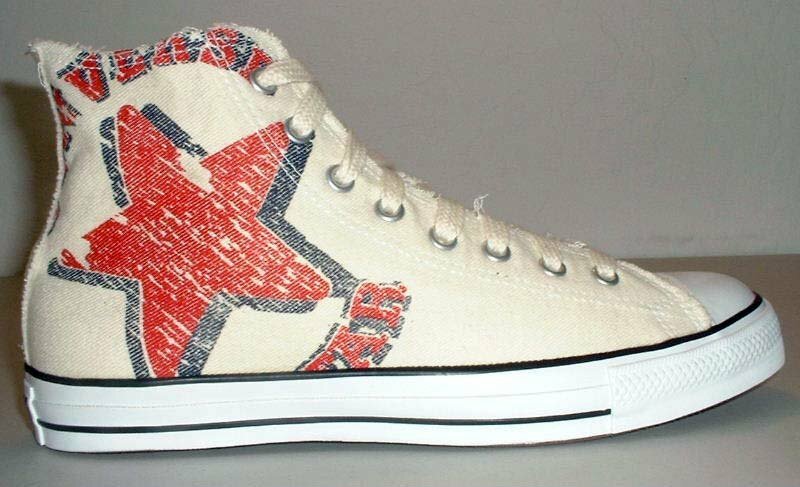 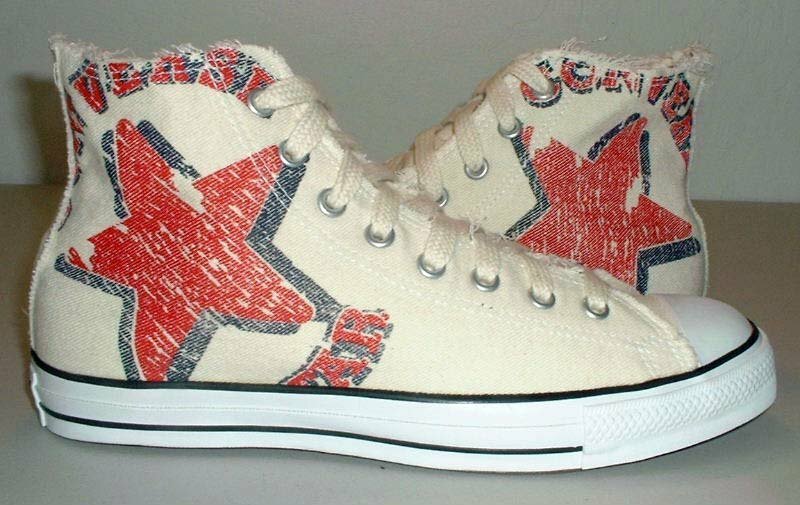 61 Natural White High Top Chucks Wearing graphic star high tops, front view. 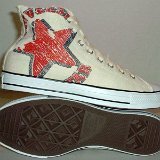 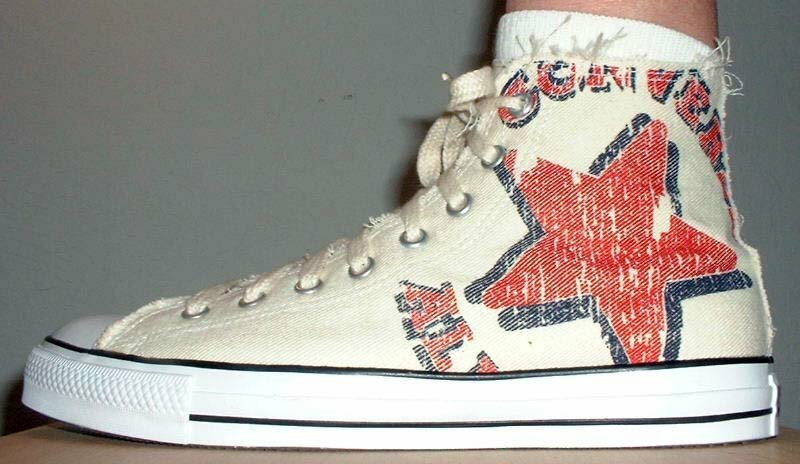 62 Natural (Unbleached) White High Top Chucks Wearing a graphic star high top, inside patch view. 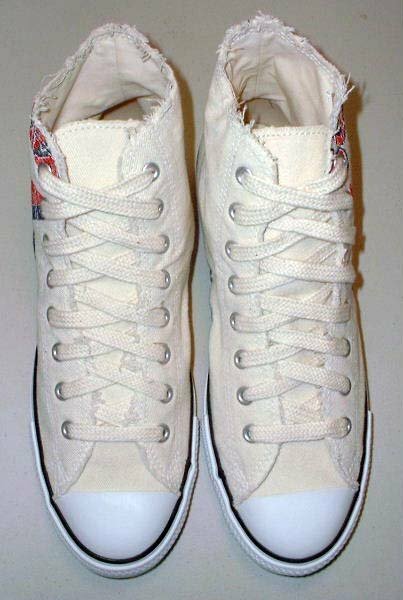 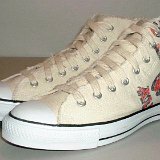 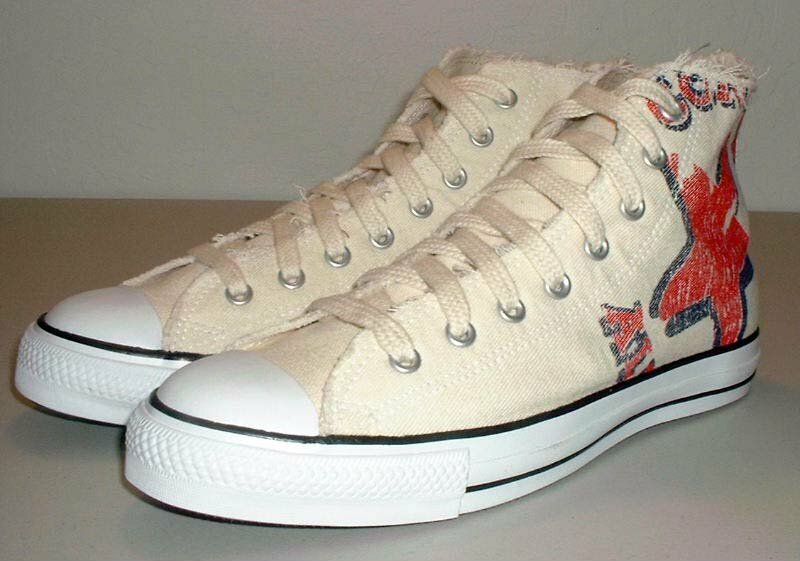 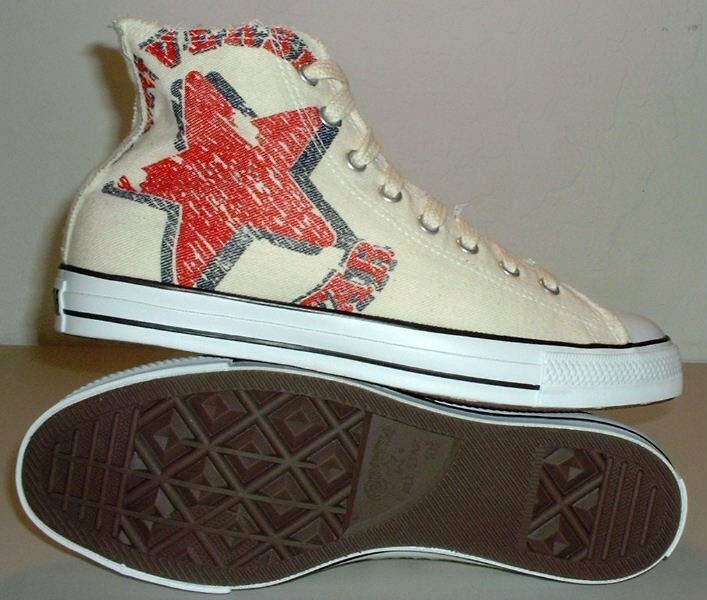 63 Natural (Unbleached) White High Top Chucks Wearing graphic star high tops, rear view. 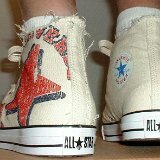 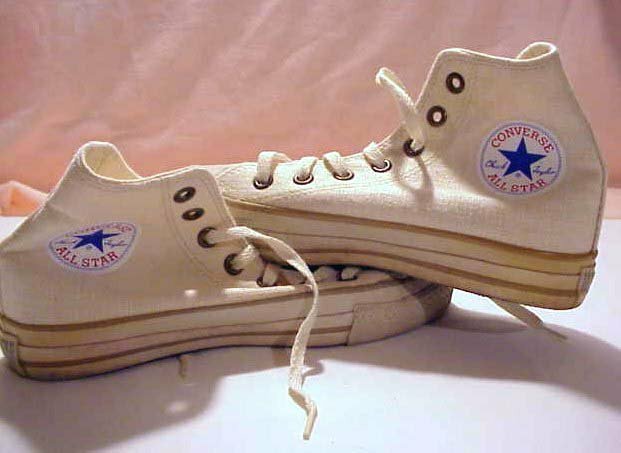 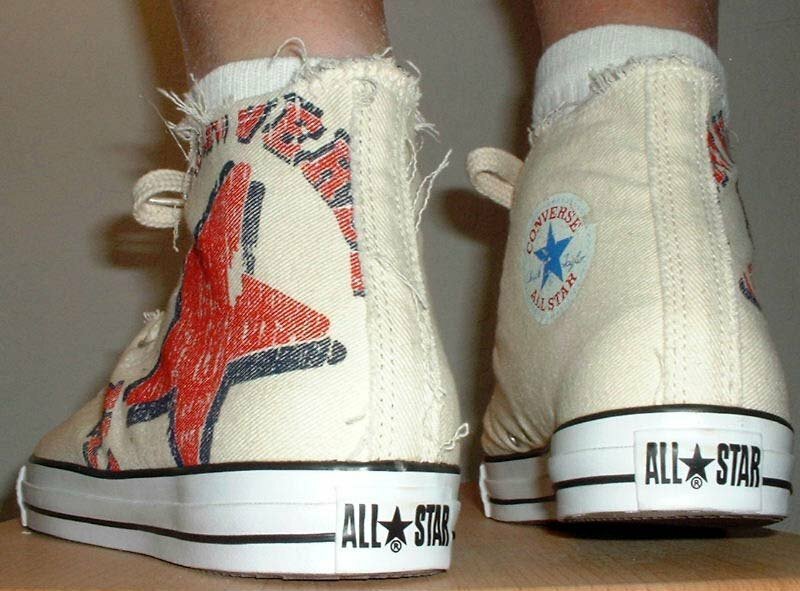 64 Natural (Unbleached) White High Top Chucks Wearing a graphic star high top, outside view. 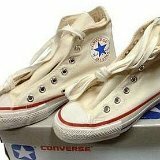 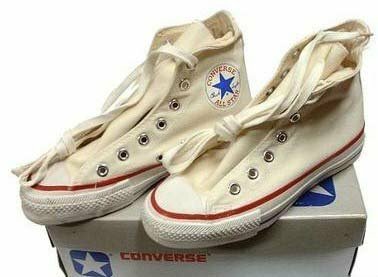 65 Natural White High Top Chucks Wearing natural white high top chucks. 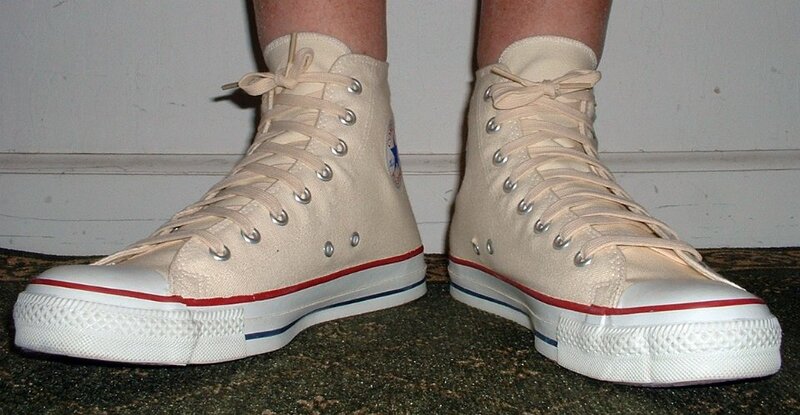 67 Natural White High Top Chucks Wearing new natural white high tops, front view. 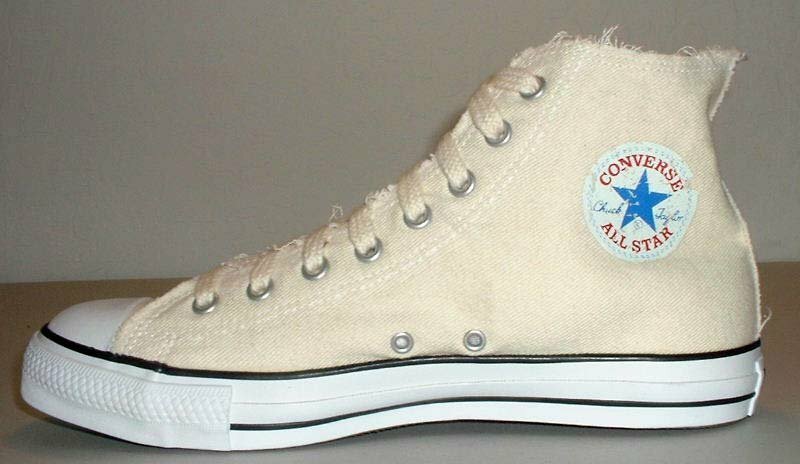 68 Natural White High Top Chucks Stepping out in new natural white high tops. 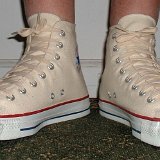 69 Natural White High Top Chucks Stepping out in new natural high top chucks, shot 2. 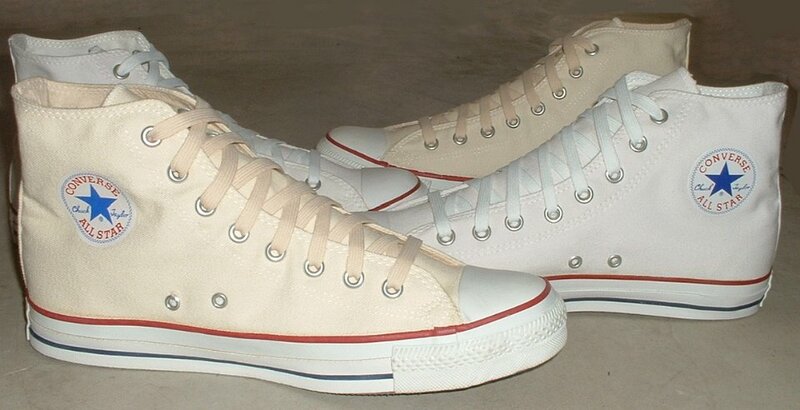 70 Natural White High Top Chucks Stepping out in new natural white high tops, side view. 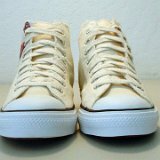 71 Natural White High Top Chucks Wearing new natural white high tops, side view. 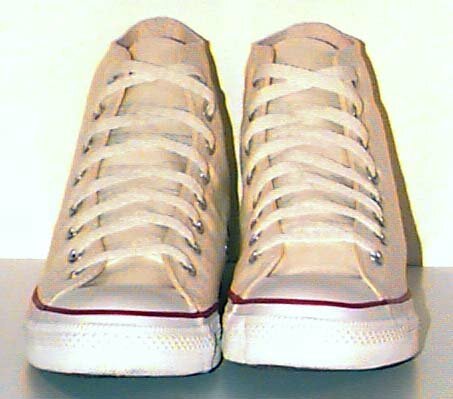 72 Natural White High Top Chucks Stepping up in natural white high top chucks, rear view. 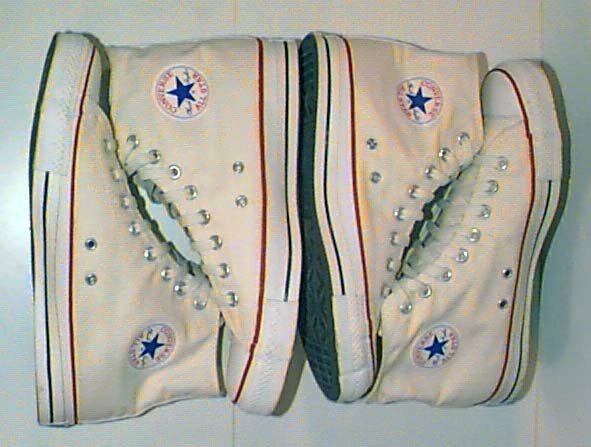 73 Natural White High Top Chucks Stepping forward in natural white high tops, right outside view. 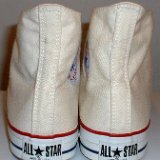 74 Natural White High Top Chucks Wearing natural white high tops, angled front view. 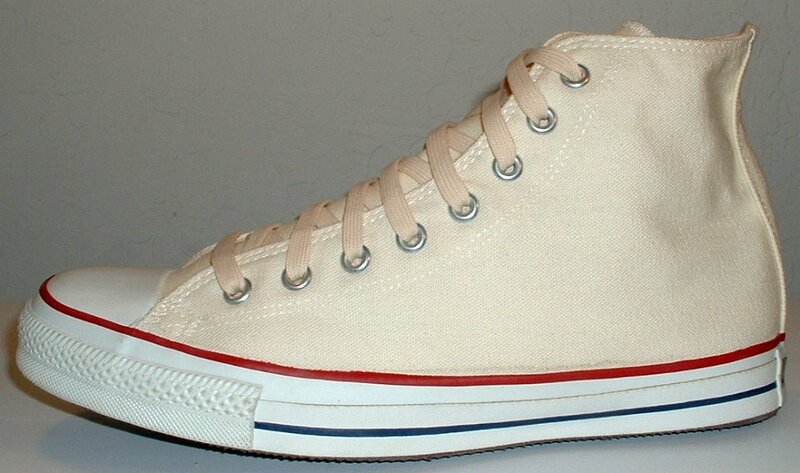 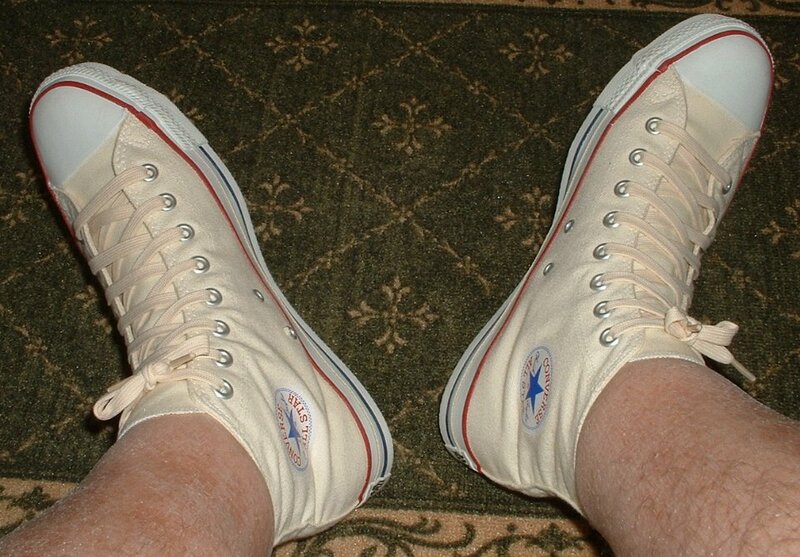 75 Natural White High Top Chucks Kicking back in natural white high tops. 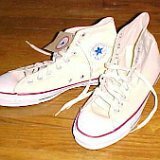 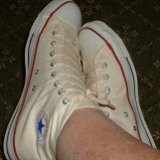 76 Natural White High Top Chucks Lounging in natural white high top chucks. 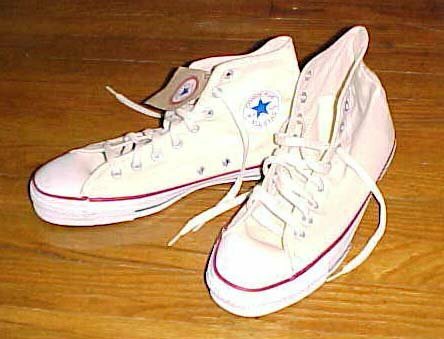 77 Natural White High Top Chucks Lounging in natural white high top chucks, shot 2. 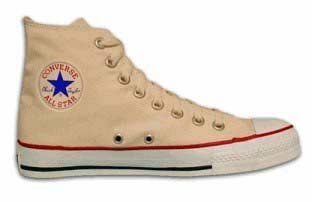 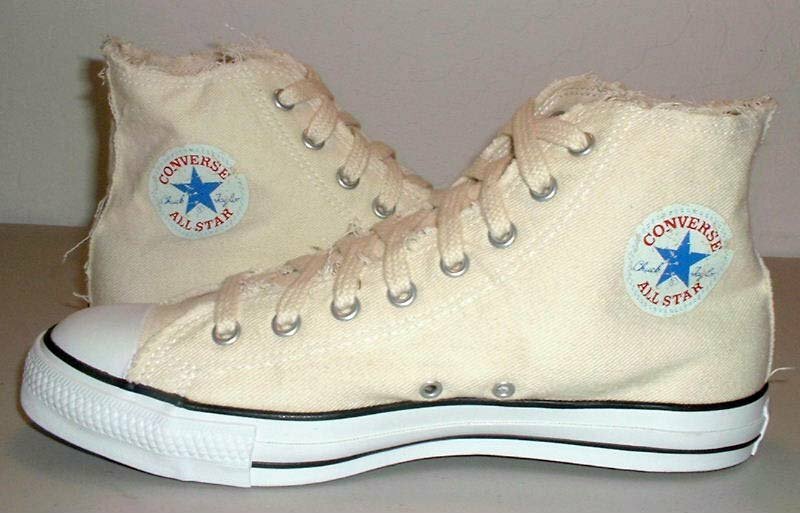 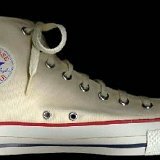 78 Natural (Unbleached) White High Top Chucks Natural white high tops with wheat colored trim and eyelets. 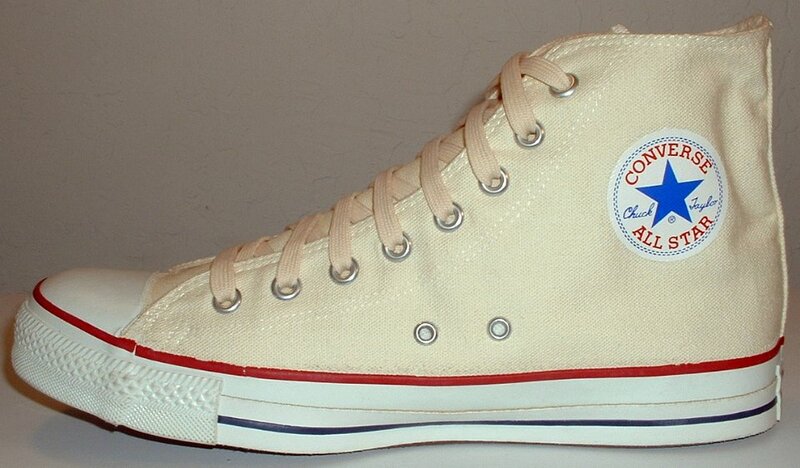 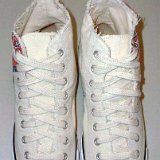 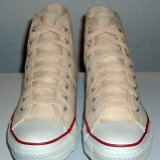 79 Natural White High Top Chucks Natural and optical white high tops. 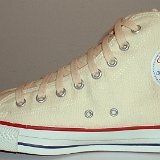 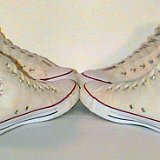 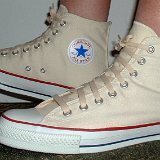 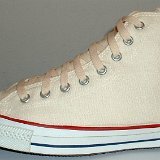 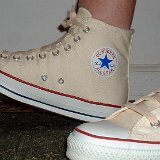 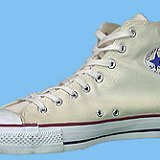 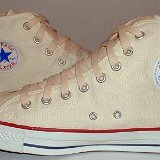 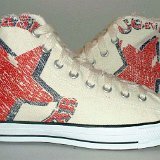 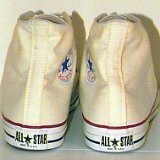 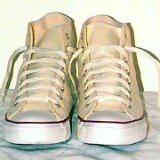 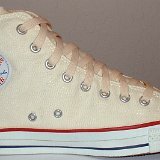 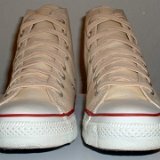 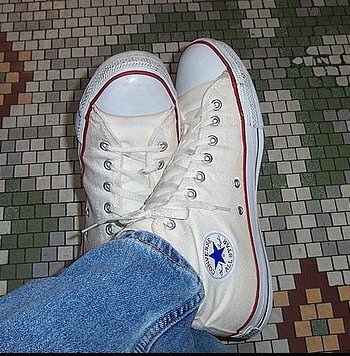 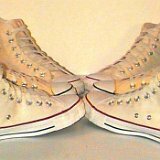 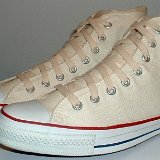 80 Natural White High Top Chucks Natural and optical white high tops.